Dahlia Time – Some of my favorite flowers are Dahlias. 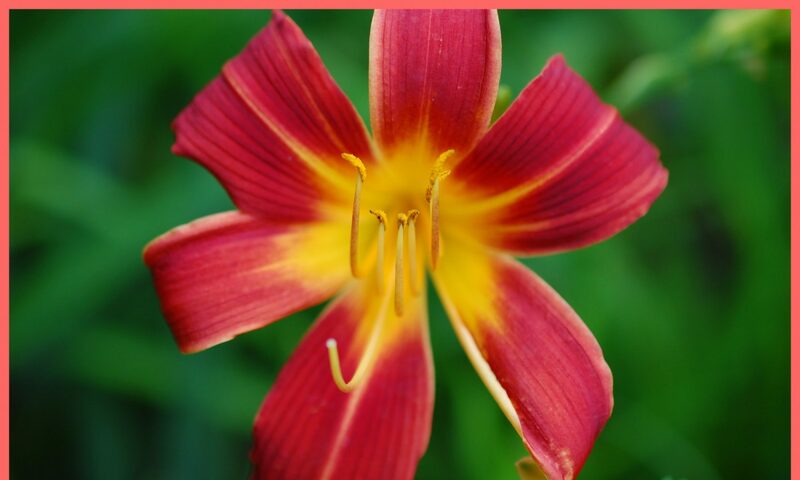 Now, when my Daylilies are all but spent, it is finally the time for late summer flowers, These beauties are here with such a wide variety of colors and shapes. Native to Mexico, they are not very hardy in my Northwest climate, and the tubers need to be dug up at the end of summer. Here are a few of the dahlias I have in my garden. I love my Pink and White Dahlia. I don’t think I have ever known its name. I have all of my dahlias in pots, since I don’t have a bed large enough to put them in. 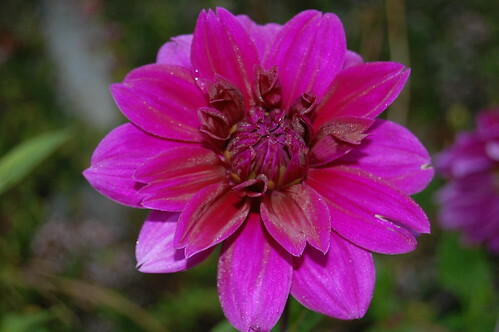 The dark purple dahlia is called Thomas Edison Dahlia. I love the deep purple of this one. (It is a much darker purple than shows up in this photo). I bought it two years ago in the Seattle Home And Garden Show. Still, it wasn’t the elusive near blue that I wanted. Light purple. Worton Blue Dahlia. I love the color of this one…nearly blue….well, lavender anyway. This is about as close as you can get to blue. I bought this last year at a Dahlia Farm. The next one is a Red and Yellow Pinwheel Dahlia. Purple and White Pinwheel Dahlia. I just bought this one and I forgot the name already. Of course the name is blurred. I really have to do a better job of marking my plants. Cheyenne. I love this hot Orange Spider Dahlia. I saw this on a garden tour, but couldn’t find out the name. It took awhile, but I found this one which looks like what I saw. 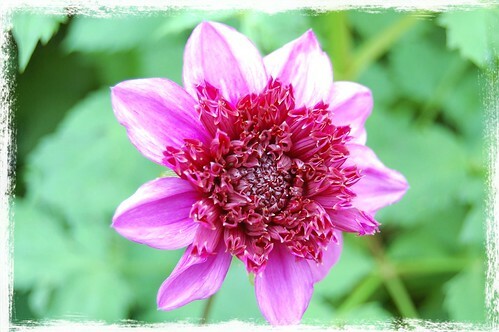 I love the contrast of the Magenta Dahlia with Purple Foliage. I have seen another with purple foliage that has bright orange flowers. That is a stunner as well. 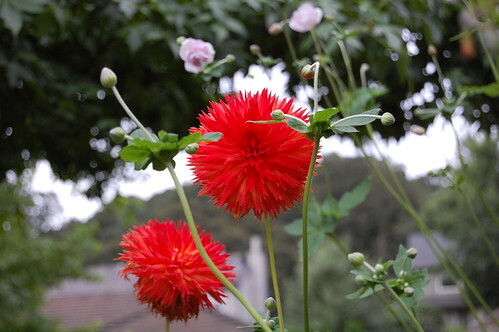 And the Magenta Dahlia With Puff Center is an unusual beauty. The yellow and pink one is Peaches and Dreams and is one of our new acquisitions from last year’s dahlia farm excursion. 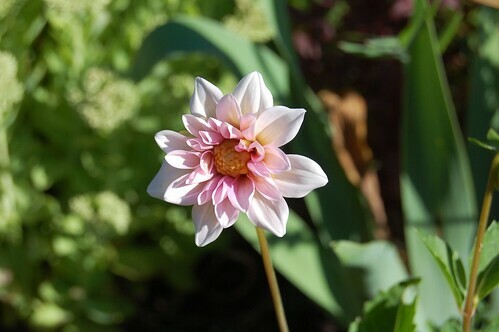 This Pale Pink Dahlia is sure a beauty. It has not yet bloomed this year. My Purple and White Dahlia is one of my favorites. We thought that we had lost this one, but this year, here it is again, putting on quite a display this summer. We have three new dahlias that have not yet bloomed, but here are some photos that we took last year at the dahlia farm where we purchased them. I don’t have a photo of the third one. Thank you and thanks for coming by. I really love all the different colors and forms of dahlias. 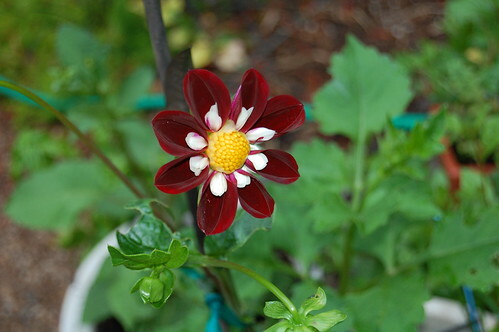 This is a really good tip about growing the dahlias in pots and then bringing them into the garage for the winter. I haven’t tried that, but I think I should next year. 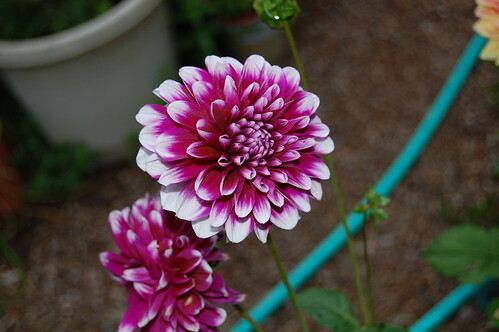 Your dahlias are gorgeous–I live the little pinwheel ones. None of my dahlia tubers survived indoors last winter, so I have none this year. I am going to try to do a better job with them next! How cool that you got to visit Athens–it is a beautiful city! Thank you for stopping by my blog today, Yael. Your cuke recipe sounds really good, too–I am looking for cuke recipes at this time of year when the plants are starting to produce. Take care, Yael–always a pleasure to hear from you. Putting them in pots sure makes life easier. However, the plants don’t usually grow as big or give as many flowers. Still, it works for us. This year, we will need to divide them, because we didn’t last year. I hope I don’t have something horribly pot bound. I have lost quite a few of my dahlias, including one pass along that I got from a former coworker that Always gave me tons of extra tubers. I really loved that one day I had in Athens. A group from my ship went to the Acropolis and attached ourselves to a tour and heard the full historical and architectural interpretation of the site. It was so interesting. The view was astounding. The rest of the time we wandered around in the city, ate and shopped. I love hearing about your trip to Athens, Yael–it sounds like so much fun! I’d love to go back sometime. 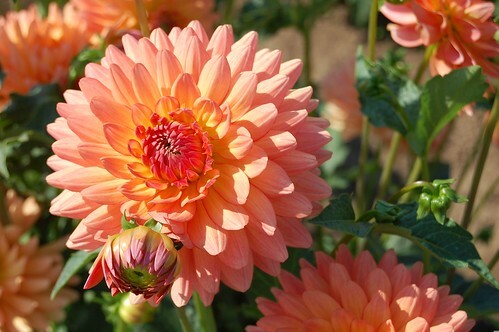 Beautiful shots of your gorgeous dahlias! I love them, but I don’t grow them in my garden since they are the snails favorite flower. I really do love dahlias, but as you note snails and slugs love them. It seems that once I have them past the tender shoot size they don’t bother them as much, so my job is to get them there. Thanks, and thanks for coming by. 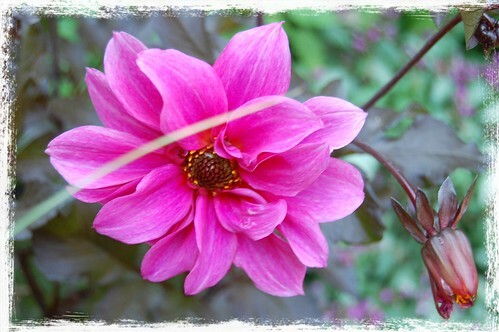 One of the added benefi of dahlias, beside their being beautiful, is that cut flowers last a really long time. I love cutting bouquets for the house. WOW, you have a gorgeous collection of Dahlias. I love them all. Thanks for sharing your lovely mosaic, have a great day. Thanks and thanks for visiting. These are some of my favorite flowers and definitely my favorite for cutting. You have a wonderful selection of different forms and colors. 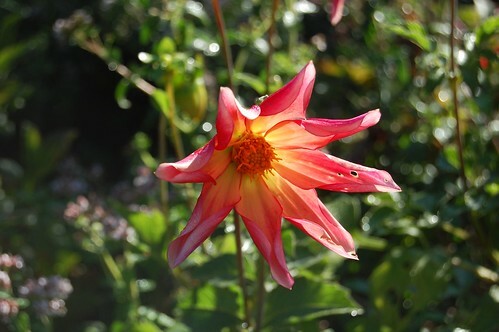 Dahlias are great as they come on strong when many garden plants are giving up the ghost. Thanks for coming by. The variety of form and color is one of the things I really love too. And, I agree that they are really great to have when other flowers are petering out. Your Dahlias are gorgeous. It’s amazing how many colors and varieties you have! Just beautiful! Thanks and thanks for coming by. With my revision of some flower beds, I am hoping to find a place to put them in the ground rather than in pots. Hoping to get more flowers that way. My, aren’t they just a wonder. Thanks for sharing your fantastic blooms! Thanks and thanks for visiting. I do think they are a orderly flower. Thanks. We currently leave ours in pots and bring the whole pot into the garage for the winter. That is fairly easy. Although you still have to unprotected them to divide them every couple years. Even when we have put them in the ground, we have it down to an easy routine and just store the tubers in paper bags with pet wood shavings bedding. Fairly easy. Thanks and thanks for coming by. Hoping that you have a good week. The dahlias are all gorgeous! Thanks. They are among my favorite flowers. Your dahlias are so beautiful. I’m too lazy to plant and dig anything up in the fall. They sure would be worth it. These are all so nice, and its hard for me to pick a favourite, but I feel I must..
Mines up as well at AussiePomm – Norwegian Weeds Dandelion!! Thanks and thanks for your comment. I would have to say that the purple and white pinwheel is one of my favorites too. Although, I love all of them. Thanks. Sorry you have not had luck with dahlias. I hope there are other lovlies that flourish in your garden or the gardens of friends. Hoping you have a great week. Thanks, and thanks for coming by. I will be sure to check out the Get Well notes from your boys. I should definitely try growing them in pots, because they are one of my favorites also! Thank you for linking up to Garden Tuesday! Thanks. By all means try them in pots. It seems to work out pretty well as long as the pot is large enough. Thanks and thanks for coming by. I really like the pinwheels tee, especially the purple ad white one. One of my fall projects is to make beds for my irises, dahlias and veggies. (separate ones at least). Hope that you have a great week. Gorgeous, gorgeous, gorgeous! I always want to do dahlias and never get around to them. Maybe next year! Thanks for stopping by and thanks for your comment. Dahlias are really enjoyable, albeit with a little work, but the results are worth it. Hope you have a great week. Thanks. There are indeed many forms and colors of dahlia. I really love the pinwheel ones, myself. They are so perky. Have a great week. Great assortment of dahlias! I don’t grow many and I grow them as annuals. No place to put them over the winter! Thanks and thanks for coming by. A lot of the time I leave mine in their pots and take them out in the spring. However, when I do divide them, I merely store them in paper bags with some wood shavings. Then I plant in spring. I have never planted dahlias before, but they are so bright and pretty! Thanks. I love them because they have so many forms and color combinations. A bright spot at the end of summer. I do really love nature. It gives us such beautiful flowers and things to eat. Thanks for coming by. Hope you have a great week. Thanks. I have actually been raising them in pots, due to limited planting bed space. Don’t get quite as big, but we do get dahlias. Pots are a thought if they don’t like your ground. Really love dahlias but don’t have a single one in my garden! Popped in from Jann’s SYCT. Your dahlias are stunning! So many wonderful colors. A truly beautiful collection. Thanks and thanks for coming by. That is one of the nice things about dahlias, they come in so many forms and colors. Hi Fellow Photo Meme participant, Just a quick note to let you know that starting tomorrow, I will begin hosting a new photo meme on my blog. Please come join me at “Orange You Glad It’s Friday”, and post a photo displaying a little or a lot of orange, my favorite color! Hope to see you there! Thanks. And thanks for letting me know about it. 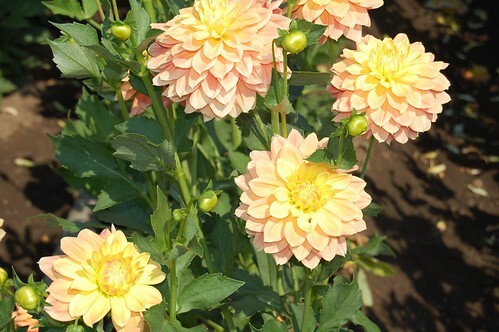 Your dahlias are especially beautiful; Daddy loves to grow them and they are such **joyful** flowers. Thanks for coming by and thanks for your comment. I agree that dahlias are very joyful flowers. So many vivid and subtle colors. 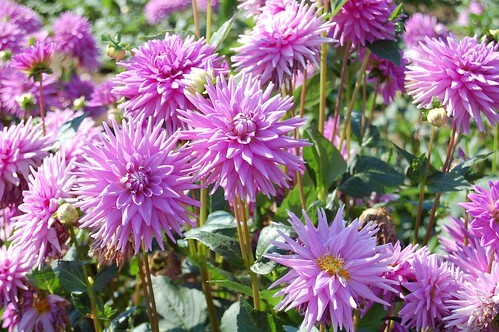 Love dahlia plants but don’t have any in my garden. 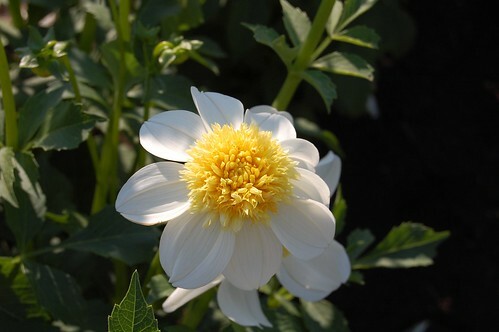 We are fortunate to have Dahlia Hill in our community where 3,000 plants representing 250 varieties are featured. You certainly have a nice collection of shapes and colors. Thanks for stopping by and commenting on my Mushroom Houses post. How wonderful to have a dahlia garden nearby. That way you can still enjoy them. Thanks for coming by. The dahlias here are as lovely as those I see in flower shows. 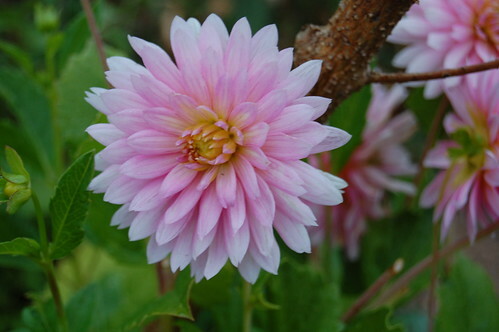 I am struggling to grow dahlia in my garden. Thanks for the tips! Thank you. And thanks for visiting. You are welcome. Hope this helps. How gorgeous! I especiall like the pinwheel ones. They are a bit unusual. I had beautiful Dahlias last year. Planned on digging them up to store, but didn’t get around to it. I was going to buy a bag at Costco again, but never did. I have missed their beautiful blooms in my garden. Thanks for sharing yours with Share Your Cup. Your dahlias are gorgeous and so many colours and varieties.